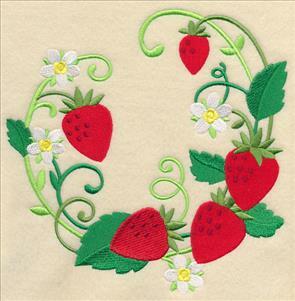 An Embroidery Encore brings a brilliant harvest of delicious fruit wreaths! 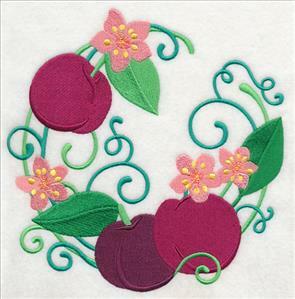 Bright fruit is ripe and ready to add fresh color and style to your embroidery projects. 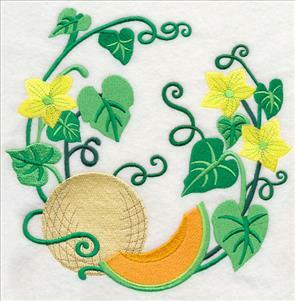 Blueberries, watermelon, oranges, cherries, peaches, raspberries, and other fruit combine with blossoms and leaves into elegant circle bouquets, bringing nature's beauty to summer stitching. 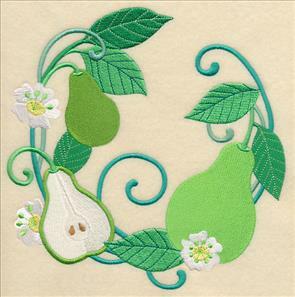 Create a splendid look for summer with tasty fruit wreaths on placemats and linens! 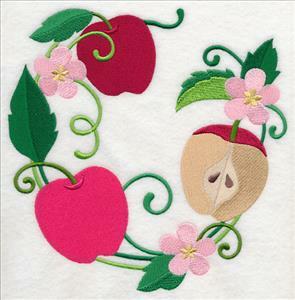 Blueberries and apples are some of the healthiest foods on earth, and make smart embroidery embellishments, too. 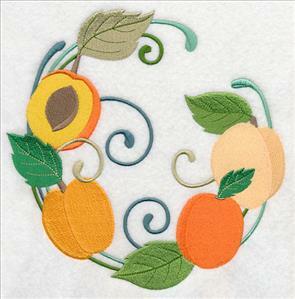 Circles of fruit add a colorful look to aprons, towels, trivets, and more. 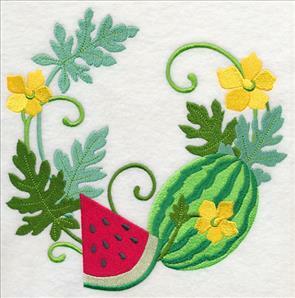 7.79" x 7.80" and 6.90" x 6.91" and 5.86" x 5.87" and 4.84" x 4.85" and 3.86" x 3.86"
Cool off your embroidery projects with sweet-tasting strawberries and mouth-watering watermelon -- both at their peak of flavor during the hot summer months. 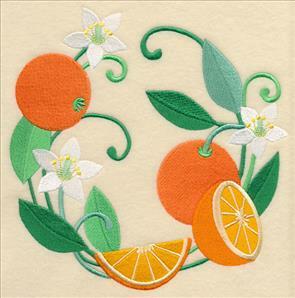 7.80" x 7.78" and 6.93" x 6.90" and 5.88" x 5.86" and 4.86" x 4.85" and 3.85" x 3.84"
Stitch your recommended daily allowance of vitamin C and potassium with oranges and bananas, tasteful and healthy additions to kitchen and dining room linens. 7.76" x 7.80" and 6.90" x 6.94" and 5.86" x 5.89" and 4.84" x 4.87" and 3.84" x 3.86"
Cranberries aren't just for Thanksgiving and Christmas! 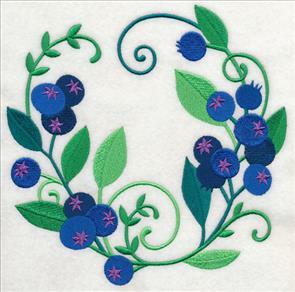 Brilliant berries add gorgeous color to towels, tote bags, and more. 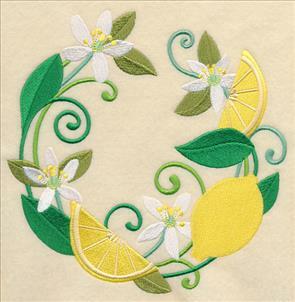 And, a wreath of lemons is vibrant with sunshine yellow fruit and delicate blossoms. 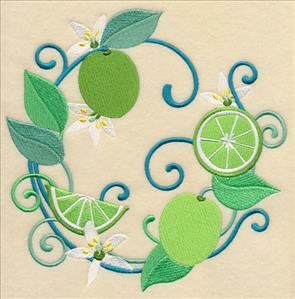 Add to reusable grocery bags for a very fresh look. 7.79" x 7.80" and 6.90" x 6.91" and 5.86" x 5.86" and 4.84" x 4.85" and 3.85" x 3.85"
Mangoes are miniature tropical sunsets in a fruit, while limes add fresh flavor to salsa and margaritas. 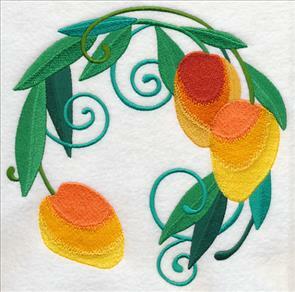 Stitch onto pillow shams for a refreshing and tasty addition to any room. 7.80" x 7.74" and 6.95" x 6.90" and 5.90" x 5.85" and 4.87" x 4.83" and 3.86" x 3.83"
Create a gorgeous fruit cocktail with ripe and juicy cantaloupes and fresh cherries. Both are linked to an ever-increasing array of health benefits. They're good-looking and good for you! 7.78" x 7.80" and 6.90" x 6.93" and 5.85" x 5.88" and 4.83" x 4.85" and 3.84" x 3.86"
Perfectly ripe plums are pleasing in shades of purple, while pears add cool and crisp appeal to aprons, towels, placemats, table toppers, tote bags, and more. 7.80" x 7.80" and 6.90" x 6.90" and 5.86" x 5.86" and 4.86" x 4.86" and 3.87" x 3.87"
The fruits of summer are here for only a short time, so enjoy them now! Everything is just peachy with the wreath on the left, and on the right apricots glow with warm seasonal color. 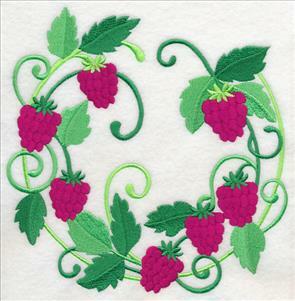 7.78" x 7.78" and 6.89" x 6.89" and 5.86" x 5.86" and 4.86" x 4.86" and 3.86" x 3.86"
Raspberries are naturally inclined to grow in cooler climates, making them a perennial favorite of northern gardeners. 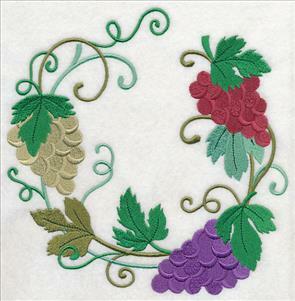 Juicy grapes come in all colors -- match colors to your project needs. 7.80" x 7.78" and 6.92" x 6.90" and 5.90" x 5.88" and 4.88" x 4.86" and 3.88" x 3.87"
If you're not already a fan of figs, you will be when you see how lovely they are in their natural state, with a deep purple exterior revealing a pearly pink fruit. So pretty! 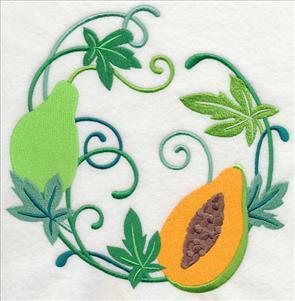 And, add a tropical touch to summertime stitching with a papaya -- the "fruit of the angels." 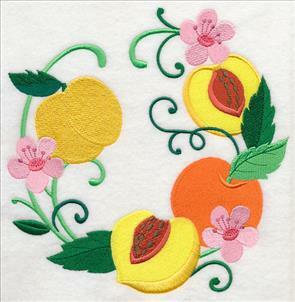 7.78" x 7.80" and 6.90" x 6.92" and 5.86" x 5.88" and 4.85" x 4.86" and 3.84" x 3.87"
Fresh summer stitching is in the bag with the Fresh Fruit Wreath Design Packs. 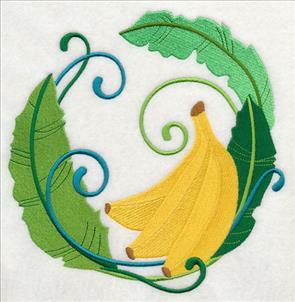 Get all the beautiful and nutritious fruit for healthy quilts, pillow covers, wall hangings, towels, and more! Order the designs individually by clicking the links above, or get the pack with all 20 designs. 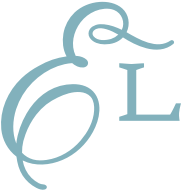 Five sizes are available to suit any project. 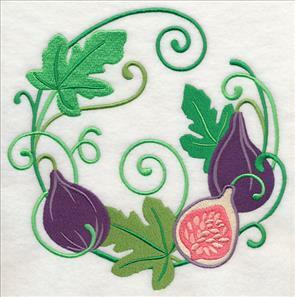 Drawing and digitizing embroidery designs ignites our creative spirit. 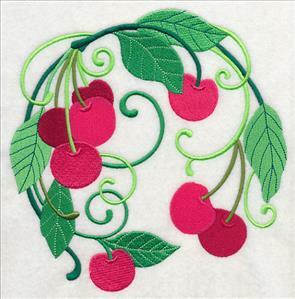 We dreamed up a couple of ways to use these fruit wreaths, and wanted to share our ideas with you! 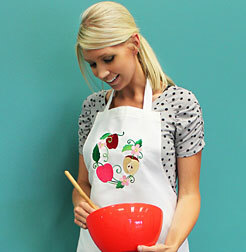 The graceful wreath shape is a perfect fit to the bodice of an apron. We used one piece of cutaway stabilizer (2.5 ounce) on the back. 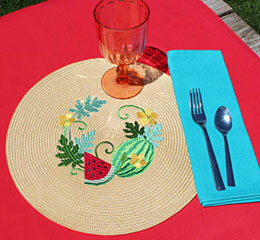 Bring the rainbow colors of fresh fruit to your summer projects! 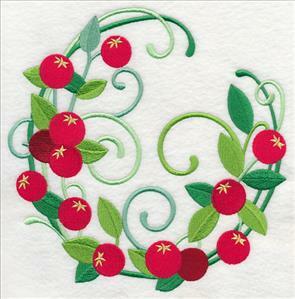 Colorful wreaths are beautiful on placemats! We hooped a piece of cutaway stabilizer, then affixed this straw placemat to the stabilizer with spray adhesive and pins. A sharp needle (size 11) is perfect for penetrating the weave of the "fabric."